 The new ruggedized XT helps ADV Riders get further off the beaten path. All too often, it’s the Adventure Motorcycles with superbike horsepower, staggering suspension travel and sky-high price tags that get the lion’s share of attention. But the bikes we lust after aren’t always the most practical to live with. 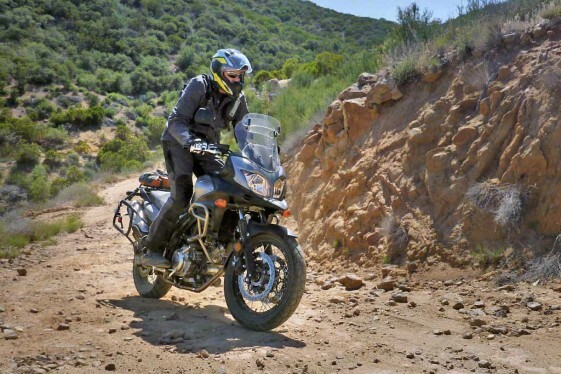 So it’s no surprise that a large number of pragmatic Adventure Riders have made the sensible choice of buying a Suzuki V-Strom 650. The V-Strom 650, or Wee-Strom as it is affectionately called, is one of the most popular adventure bikes worldwide and regularly outsells its big brother — the V-Strom 1000. Introduced in 2004 and now on its second generation design, the V-Strom 650 is an understated, everyday machine known for its exceptional reliability. It also has a reputation for being an excellent long-distance touring bike with a propensity for light off-road travel. And for 2015, the more-rugged XT model has the potential to take adventure riders even further off the beaten path. Crash bars, touring windscreen, aluminumn panniers, tubeless tire compatible wire-spoked wheels and a front beak set the XT apart from the standard V-Strom 650. The new V-Strom 650 XT features tubeless tire compatible reverse spoke wheels (19″ front / 17″ rear) and strong steel crash bars that improve its ability to absorb punishment in the dirt. The XT also gets a 3-way height-adjustable windscreen fitted with an adjustable touring spoiler that redirects wind around the rider more efficiently. Also standard on the XT, are roomy (45 L Right / 37 L Left) aluminum side cases and electronic ABS brakes. 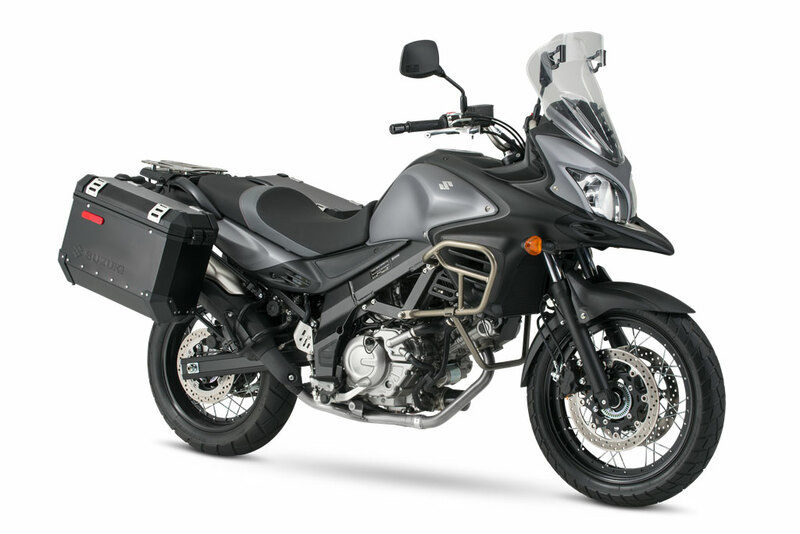 In addition, the V-Strom 650 XT gets a distinctive front beak with integrated air ducts, which are said to help channel air toward the radiator. 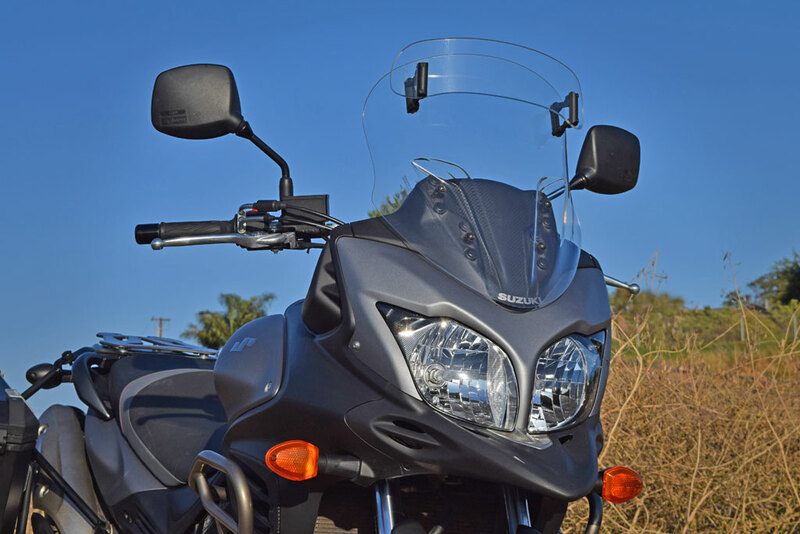 Vents in the V-Strom 650 XT’s new beak help channel air toward the radiator and the small windshield spoiler is effective at diverting wind over the rider’s head. Both the V-Strom 650 XT and standard V-Strom 650 utilize the same 645cc, liquid-cooled, DOHC, 90° V-Twin based on the SFV 650 Gladius’ powerplant. The motor produces roughly 68 horsepower, which is engaged through a 6-speed transmission. Braking is provided by dual 310mm front discs and a single 260mm rear disc. A robust twin-spar aluminum-alloy frame, 43mm upper fork tubes and a link-type swingarm give the V-Strom 650 XT stability at speed. The suspension is preload adjustable front and rear, and the rear shock includes adjustable damping. Suspension travel is fairly tame at 5.9 inches (150mm) in the front and 6.3 inches in the rear (159mm), and ground clearance is a modest 6.9 inches (175mm). Instrumentation is handled by an analog tachometer and LCD speedometer. The LCD console includes odometer, dual trip meters, gear indicator, engine and outside temperature, average fuel consumption, fuel level and a clock. Toggling through the LCD readings is achieved while keeping your hands on the bars via a left-hand index finger switch. With its 61.5 inch (1560mm) wheelbase and 32.9 inch (835mm) seat height, the V-Strom 650 XT has a relatively long and low stance. Slightly forward foot pegs put the rider in an almost cruiser-like riding position and a low reach to the ground inspires confidence for shorter riders. The bike has a roomy feel, but the tank does splay the knees slightly for taller riders. Fit and finish on the bike is top notch but some of the pieces like the small gauge steel handlebars and faux carbon fiber panels have a budget-oriented feel. Some may not be fond of the new beak styling but we think it gives the bike character. A close look at the factory panniers reveals thin sheets of aluminum and the mounting hinges that are lightly built. Installing and removing the panniers on the rack is quick and easy, although a sticky key made locking and unlocking the panniers difficult. The problem was improved after applying some graphite lubricant to the keyholes. Our first ride on the V-Strom revealed a perfectly tuned EFI with excellent throttle response. The power off idle is mild and the transmission shifts effortlessly. The XT never misses a shift and grabs neutral every time at a stoplight. A well-padded saddle contours to the rider’s body, while rubber-covered foot pegs and bar-end weights help eliminate any hint of vibration. Our first acceleration run up a highway on ramp was an eye-opening experience. If you’ve spent much time on 650cc thumpers like the DR650 or KLR650, the V-Strom’s power advantage is significant. It’s hard to believe you are actually riding a 650cc, and the acceleration is much closer to a BMW F800GS than it is to a KLR. Mid-range power is less impressive but adequate enough to not require excessive down shifting. In the higher revs is where the V-Strom really comes alive. The exhaust note is subdued but the distinctive V-Twin rumble can be heard when you open it up. On the highway, there is ample power for passing cars and triple digit speeds can be reached rather quickly. It’s one of the smoothest motors we’ve ever tested, regardless of size, with only a whisper of vibration at 65 mph. With cruising speeds in the 80 mph range, the V-Strom has no trouble keeping up with big-bore adventure bikes. The two most impressive features of the V-Strom after the motor are the windscreen and seat. The windscreen with its spoiler attachment is incredibly effective for diverting wind over your head, even with taller riders. And the seat offers a level of comfort that is almost unheard-of for a stock seat. The V-Strom 650 accelerates like a rocket when you twist the throttle, but that’s where its sporty feeling ends. The laid back foot forward cruiser body position isn’t ideal for the twisties. On the backroads, it labors through turns with a vague feeling front end. It’s hard to gauge how far you can push the bike in the turns and then once speeds pick up, the bike’s long foot peg feelers start scraping. 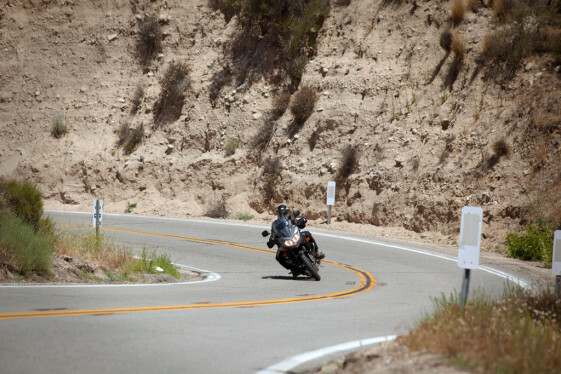 The V-Strom 650 can go around a turn fast but prefers cruising speeds in the twisties. While the V-Strom 650 can be ridden hard in the turns, you quickly realize it prefers to cruise while you sit back and enjoy the sites in comfort. However, the bike has a stable feel in the turns and the ABS brakes work well enough to provide safe stopping distances on a variety of surfaces. A little ABS pulsating is noticeable but it simply gets the job done in a practical and efficient manner. Great report! I wish Suzuki would make this bike just a bit more off-road oriented. I have a 2012 V-Strom 650… same bike but without the (IMO idiotic-looking) beak and with cast wheels instead of spoked. It’s a great bike. It’s way better off-road than you would think possible, but like the review says, if you take it slow, it does fine. I installed an ABS off switch (Google “Eastern Beaver”) for about $20. I’d love to have the spoked wheels for mine, but I do most of my off-road riding on my DR650, so it’s not worth the nearly $2000 cost to add them. The V-Strom is an awesome bike, and between its price new plus what you can buy them for used, it’s hard to beat it. True, it’s an awesome bike and we really hated to see it go when it was time to give it back to Suzuki. Thanks for the tip on the aftermarket ABS Off switch Rob G! Bought my 2014 DL650A new in January 15 and have ridden it 11,000+ miles and love it. It never seems to run out of power, has tons of luggage space and gets great fuel economy. I added an Air Hawk seat pad and Madstad windscreen — both of which make a huge difference in comfort. I love the big fuel tank and the pessimistic gauge warning of NO FUEL !! at 230 miles. Even after covering 250 miles, I’ve never managed to squeeze in more than 4.5 gallons. I ride off-pavement — not off-road — and it’s great for fire roads, forest roads and the like. I have no interest in riding it on technical trails and, while I’m sure it would be ok (except for the front pipe) there are definitely better choices out there for off-road use. I wish someone would make a low bike with semi-knobby tires, six speed, big fuel tank and saddle bags. Such a bike would be an “all-road” bike — suitable for highway, back roads and dirt roads — not off-road. I’m thinking of something like a Star Bolt but with the lusty (and torquey) Vstrom 650 motor. Bikes all seem built to fit a niche — road racer, standard, “adventure,” cruiser. How about one that does everything well? Hi Surly Jason. Suzuki really created a classic with the V-Strom 650. True, there are better choices out there for off-road use but it would be nice to have one bike for virtually every type of riding. We’ll see how much we can expand the XT’s dirt riding capabilities after a few mods in our follow up story. 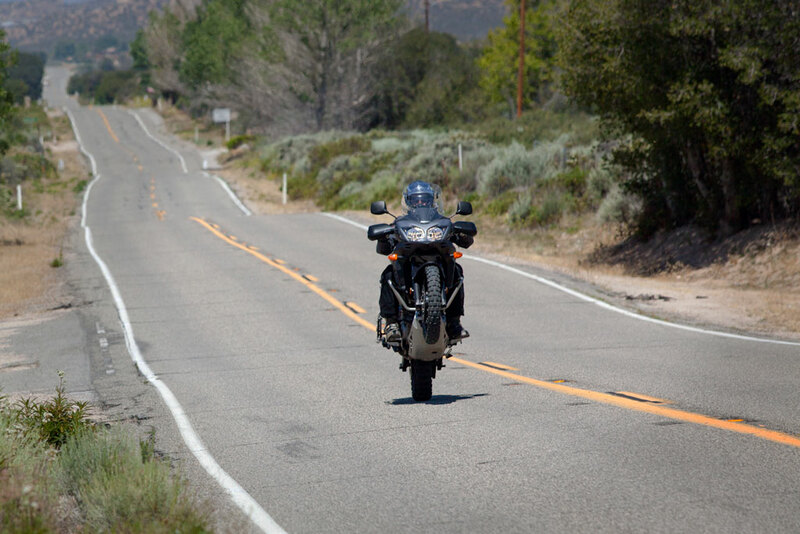 Thanks for sharing your experience with the V-Strom 650! The cure for the sticky key operation is too apply slight downward pressure on the key as you turn it. Are the crash bars actually solid steel? And, if so, how much do they add to the weight do you think? My 2014, they are tubular for sure. Bike is quite likeable. Hi David. Yes, it is quite a likable bike. The bars are actually tubular steel. The solid reference was meant to emphasize their strength. Sorry for the confusion. We’ve updated the text. Thanks! Look at Twisted Throttle’s offerings and you’ll see that the Wee’s panniers, luggage mounts, and engine guards are either made by or licensed from SW Motech. As part of an OEM accesory package they added another $1,200 to the cost of my 2013 Wee ADV, so I’m guessing that they’re the real deal. Thanks for the article – so seeing that you’ve ridden the latest and greatest since this was written from other manufacturers – wondering how your accessory add-ons / protection improved the off-road chops of this bike and how it compares to others for more money? Thanks for any updates!